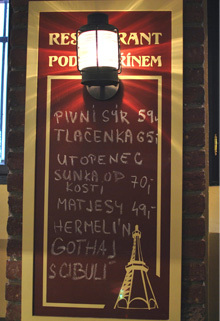 There are only very few restaurants in Prague 1 that focus on the local population rather than on tourists. We are proud that our Pod Petřínem Restaurant is one of these. Come and find out for yourself. Leave the hustle and bustle of the busy street behind you, open our door and just a few stairs will lead you down into a different world. The restaurant’s welcoming interior, set below street level, may not be very large, but this only makes it that much cosier. Take a look around the tastefully lit interior and choose a place to sit – either on a chair or on one of the wooden benches that run along the walls. Relax and absorb the pleasant atmosphere of a well-functioning honest pub. Do you already know what you want to order? If you only want a light snack to go with your beer, we’d like to recommend one of our popular classics. We’re ready to serve treats such as beer cheese, soused herring, and pickled sausages with onions, all prepared at the highest level of quality. If it’s a main course you are after, we offer several hits that have become popular over the years – goulash, ribs, and steak. We do not have a permanent set menu. We prefer to purchase fresh ingredients on a daily basis and to prepare the meals we serve using only these items. Our philosophy says, “Cooked today, eaten today”. No matter what you choose from our daily offer, your satisfaction is guaranteed. And you’ll certainly also value the fact that all of our meals are available at prices that are more than reasonable. A good pub is also judged on the quality of its beer. Our standard draught beer offer includes the excellently handled and robust beers from the Pilsner Urquell and Velkopopovický Kozel breweries (both light and dark). We guarantee their taste and are sure that once you finish your first, you’ll immediately long for another. We pay great attention to the way we care for our beer, our glasses, and our tap system. All of our bartenders attend professional beer drawing training on an ongoing basis. Let them demonstrate their talent to you! As you will find out for yourself, every minute you spend in the Pod Petřínem Restaurant soothes the soul. Take advantage of our establishment’s ambience, completely unaffected by the hectic pace of the surrounding world. Just sit and rest a while and let our friendly personnel take care of you. Sports fans have the opportunity to watch all important matches. Watching matches at home alone simply cannot be compared with rooting for your team alongside other fans! At lunchtime, the Pod Petřínem Restaurant is non-smoking so feel free to bring along even the youngest of diners. They will definitely like the food we serve much better than that found in various unhealthy and overpriced fast-food restaurants. The fact that the Pod Petřínem Restaurant is exceptional is not only confirmed by the high number of satisfied guests, but also the “Establishment of 2014” award that we received in the competition organised by the Prague 1 Municipal District. We value this success all the more because it is a competition where the public casts their vote. This proves to us that all of the effort we put into operating an honest Czech pub has placed us on the right path. Come and convince yourself!